The teutonic tuners at Carlsson managed to get their hands on the new C-Class Estate before it hit showroom floors, and the result is sehr gut. Available both in oil-burning and gas form, visual tweaks include new aerodynamically superior aprons and side moldings, as well as Brilliant edition 19-inch one-piece wheels. The CDI diesels put out 204 hp to 269 hp for the C220 and C320, respectively. The 3.5-liter V6 gets a boost to 295 hp for those less concerned with the mileage. The interior is also touched up with "attractive yet restrained" components meant to mimic the exterior's mimicking of the larger S-Class. All said, it's a mighty nice way to get groceries if you're across the pond. Press release below the jump. With the new C-Tronic® Diesel POWER generation, Carlsson offers 20 % more power and torque for all Mercedes common-rail diesels from the A to the S Class. Increasing the output via the C-Tronic® Diesel POWER supplementary control unit results in a significant improvement in performance. Consisting of the control unit and a plug-and-drive adapter, which is connected to the standard engine control unit, the C-Tronic® reads all signals from the series control unit needed to determine the optimum values for fuel quantity and the injection point. The new generation of C-Tronic® performance kits for four-cylinder CDI models of the C and E Classes provide a power increase of 34 bhp. Thus, the engine generates 204 instead of 170 bhp and a torque of 480 instead of 400 Nm. The result is a second off the time for the 0-100 km/h dash and a reduction of no less than seven seconds in the 80 - 180 km/h time. 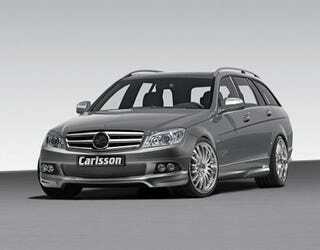 The Carlsson C-Tronic® CD 32 has been developed for all Mercedes Benz models fitted with the current basic 320 CDI engine. The increase in power amounts to 42 bhp so that the modified engine produces 269 bhp outpacing easily the standard engine with its 224 bhp. Torque rises to a massive 612 Nm, which is available from 1,600 to 2,300 rpm. No less impressive are the performance figures, which improve by around a second for the sprint from 0 to 100 km/h. To ensure the greatest possible safety for both driver and vehicle, the C-Tronic® Diesel POWER has correction maps that guarantee the engine's reserves are only used when the operating parameters are within the appropriate range. Thus, the coolant temperature is monitored and the additional power only generated when the engine is running at a coolant temperature between 65° and 100° C. The intelligent control system ensures the optimum settings are selected regardless of the operating conditions. Carlsson gives a three-year warranty on the new generation of C-Tronic® supplementary control units. The environment also benefits from the C-Tronic® Diesel performance kits. Through the intelligent use of modern technology, the C-Tronic® reduces average fuel consumption and in the course of that CO2-emissions by 10 %. At the same time is reduces pollutant emissions, slashing environmentally harmful exhaust gases, such as NOX, by around 10 %. Carlsson has been a successful competitor in the VLN Long Distance Trophy at the Nürburgring for many years. At the world's most demanding race-track for both driver and technology, Carlsson tests parts that are later to be found in its range of parts and accessories. The company currently uses the CK35 performance kit based on the 3.5 litre V6 for long-distance racing in an SLK. In other words, every Carlsson CK 35 customer participates in Carlsson's racing success. "The concept of taking developments 'from the race track to the highway' applies to the CK35 more than any other engine", says CEO Markus Schuster proudly explaining how this piece of high-tech engineering has been breathed on to ensure durability and great efficiency.